A self storage unit can make life a whole lot easier, especially if space in your home or business is hard to come by. Seasonal items and decorations, summer cars, old furniture, and things from the kids’ rooms while they are away at university, are some of the things storage facilities can help you to get out of sight and out of mind. That being said, it’s important to know what type, and especially what size storage unit is going to work best for you. Below are some tips for choosing the right storage unit size. Before you put anything in a storage facility, it’s a good idea to make an inventory of everything that you plan on storing. Itemize your list based on how much square footage you think things are going to take up, and plan accordingly. Storage pricing varies, by facility and by size. You want to make sure you have enough space for what you know you are going to store, while leaving yourself enough space to manoeuvre things in and out of the unit comfortably. If you are planning on putting things in a storage unit for a short amount of time, you don’t need to think about extra space. But if you think your items may stay in the unit for an extended period of time, ventilation is important, and giving your items room to breathe will help protect them and keep everything in decent shape over the long term. This also means planning out the layout of your unit so that you have easy access to the things you are going to need in the short term. As mentioned, storage pricing is based on a number of variables, the most important of which is size. Contact local facilities and compare pricing on square footage. Certain square footage in one location might cost more than another, especially if they are more centrally located, or if the units come with other amenities like climate control or drive up access. Your storage unit is an investment and like any investment, you want the best return possible. Don’t settle for the first storage facility you come across, make sure that you balance the convenience and cost factors, and put some time and consideration into planning what you will store and how you will organize your items. 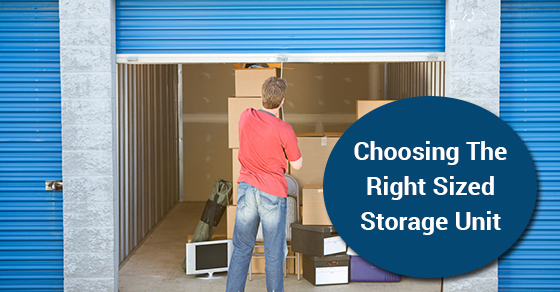 Keep the above tips in mind and choose the storage unit that makes sense for your needs.